The Moose (Mus/Moz/Tia’m/Maiiz) - Maliseet, Abenaki, MicMac, Penobscot. “Moose to us (The Wabanaki) are what buffalo were to the Plains tribes. Moose hides provided temporary shelter, temporary canoes, winter blankets, much of our clothing, and containers. Moose bones were used for dice for the game of Waltes, sewing needles, awls, spear points, pipe bowls, fishing hooks and more. Moose hair was used like sewing thread for embroidery on the clothing of hides and on birch bark items. Moose tendons and skin (rawhide) were used for bow strings, andt he webbing and lashing on snowshoes. Some body parts were considered medicinal and moose meat provided a major part of our diet, for some us it still does.” Joe Hugga Dana, Penobscot tribal member and registered Maine Guide/moose hunting guide. Wabanaki are a confederation of some of the Algonquian speaking tribes: the Abenaki, Maliseet, MicMac (Mi’maq), Passamaquoddy and Penobscot tribes that reside in Maine, Vermont, Quebec and the Maritime provinces of Eastern Canada. The moose is the largest living species in the deer family. Moose are distinguished by the broad, flat antlers of the males. 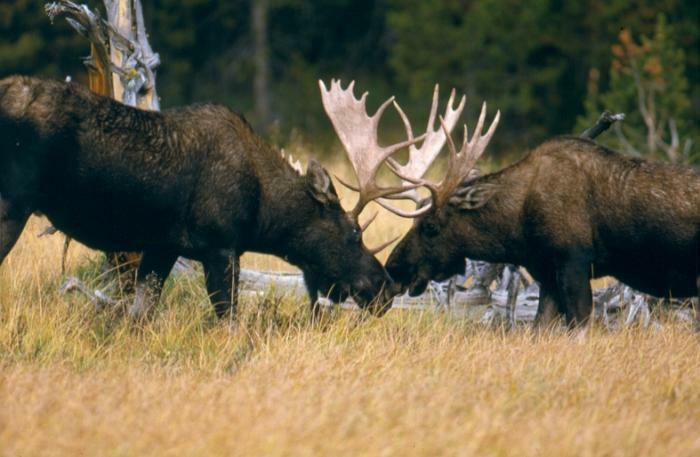 Currently, most moose are found in Canada, Alaska, New England, Rocky Mountain states, Scandinavia, the Baltic States and Russia. Moose have long been important in the Wabanaki’s legends and art as well. One of the few Wabanaki petroglyphs can be found on the banks of the Kennebec River, it is of a moose smoking a pipe. This is the only early representation of a moose smoking, but there are numerous early examples of a rabbit smoking a pipe. 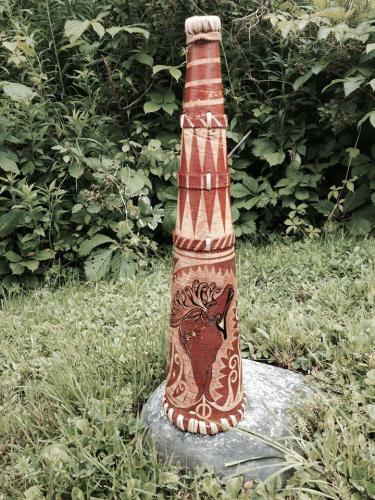 Joe Hugga Dana has memorialized this smoking moose on one of his best root clubs, Spirit Moose; Root Club < Click link to view this - photos show the smoking moose, as it is done on around surface a photo can't show it in it's entirety, there are 2 photos, 1 showing the pipe, another showing the moose. There is a previous "News Article" on Moose Hair Embroidery c/1700-1800's, < or click link to read it. There are other moose hair embroidered items on this website in the "Vintage Maine Items" section.